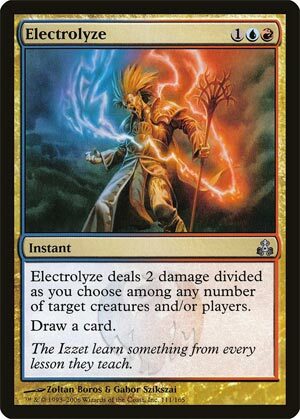 Electrolyze is a great reason to be playing some kind of Izzet-colored spell-based deck in a format where it’s possible. (Psst: This is another thing that’s true of Filth Casserole!) The cantrip ability may be listed last, but it keeps the cards flowing and any deck running, and the ability to split the damage between targets is often shockingly good. It may be true that creatures are on average larger than they used to be, but an awful lot of them are still susceptible: off the top of my head, Birds of Paradise and Dark Confidant are central to a lot of decks’ game plan and fall easily to this. The only downside I really see to Electrolyze is when people hold it in their hand longer than they probably should because they’re trying to do something cute, like hit two one-toughness creatures for the three-for-one. Sometimes the right play is to just hit one creature, or even the opponent, and get a smaller but important tempo boost. A much “fairer” card than Golgari Grave-Troll, but a powerful one all the same. Stapling a cantrip to 2 damage is a strong spell, and the additional upshots of Electrolyze (instant speed and the ability to divide the damage as you please) have pushed it to staple status in Modern decks. Picking off two weak creatures in one card is a lot of value, and Electrolyze offers a lot of hidden strength for that reason. Any spellslinger-type deck will find a home for this particular spell.